Oh God, we long to be more like You. When we see someone on the side of the road may we not pass judgement. May we offer up a prayer, offer financial assistance or give them a meal. 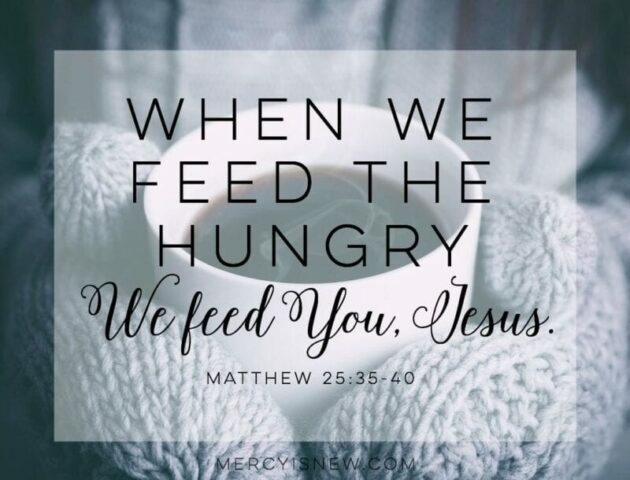 When we see the hungry, may we see You. When we see the thirsty, may we see You. We we meet a stranger, remind us that we are meeting You. May we clothe the naked and visit the sick. May we not be self-righteous but wearing only the righteousness of Jesus as we walk through our days and into this world. Well, being a compassionate person, whose spiritual gift is overwhelmingly mercy and exhortation, you might say that I have made this mistake a LOT of times. My empathy levels are through the roof when I encounter a hurting person. I always try to relate something I’ve been through to the person so that they know that I can somewhat understand their plight. But, I know that many times, in trying to help the person feel understood, I have missed out on listening to them. It was out of a heart of concern, but as it turns out, can actually be selfish.